Crunchy + sweet go together like PB + J. Am I right? So when I saw a recipe for Rainbow Cabbage Salad over at Oh She Glows, of course I had to try my own version. So, today I ran to the supermarket to pick up a few things in order to execute this lovely dish. This recipe will make enough for 4 servings and there's no cooking involved! Just a lot of slicing and dicing. 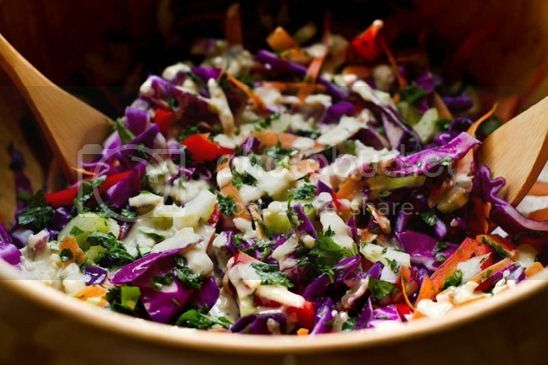 After you chop up all your ingredients, toss them in a bowl, drizzle dressing on top and taste the rainbow! I really like the crunch of this salad by itself, however, when making it a meal I topped it with 5oz of drained tuna. Sweet, tangy, crunchy and filling. Everybody wins. Newer PostSNOW DAY: Protein Peanut Butter Cocoa! Older PostThe Best Foods To Eat. Ever.